Junkies, Get Your Fix: Subscribe by Email! ...Makeup Junkie Extraordinaire! Blogger, Esthetician and Freelance Writer. I have been in the beauty industry for over 25 years! Blogs I Love And Follow! What is Acne? How Do You Treat Acne? Give Yourself An At Home Facial. Lasers Vs. Peels: Which Makes Sense For You? Summer & Sunscreens: Which are the ones you REALLY need? This gorgeous palette of four petite highlighters contains all four of Laura Mercier's infamous Highlighting Powders in shades of: Indiscretion, Addiction, Devotion and Seduction. The shades are large enough to work with yet small enough to fit in a nice palette size that is portable and can be used to slip into your purse or can be used for travel. Laura Mericer Highlighting Powders are known for their gorgeousness. They go on with silky perfection, highlight any area of the face or décollétage and stay on all day without fading. 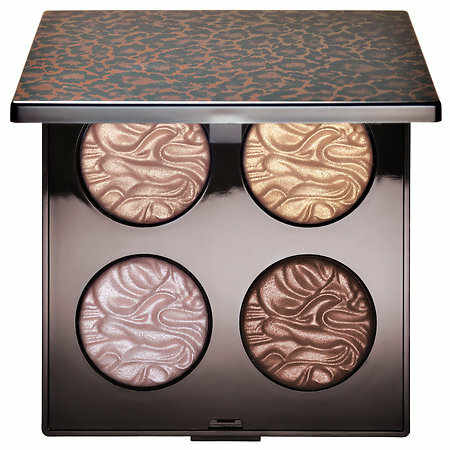 The Highlighting Powders are known for being some of the best on the market. The best thing about them is that you cannot apply too much. They are extremely pigmented but upon application they go on as if they are just perfect. That what makes them so special. This palette is available at SEPHORA stores, it is no longer available online. The price is $58.00 ($65.00 value). Like SEPHORA on Facebook: https://www.facebook.com/Sephora?ref=br_tf; Follow SEPHORA on Twitter: @Sephora, Follow SEPHORA on Pinterest: http://www.pinterest.com/Sephora/; Follow SEPHORA on Instagram: http://instagram.com/SEPHORA#; Subscribe to SEPHORA on YouTube: http://www.youtube.com/channel/UC9YX5x_VU8gfe0Oui0TaLJg; Follow on Google+: https://plus.google.com/+ Sephora/posts; Follow SEPHORA on Wanelo: http://wanelo.com/sephora and Follow SEPHORA on Tumblr: http://theglossy.sephora.com/. Like SEPHORA on Facebook: https://www.facebook.com/Sephora?ref=br_tf; Follow SEPHORA on Twitter: @Sephora, Follow SEPHORA on Pinterest: http://www.pinterest.com/Sephora/; Follow SEPHORA on Instagram: http://instagram.com/SEPHORA#; Subscribe to SEPHORA on YouTube: http://www.youtube.com/channel/UC9YX5x_VU8gfe0Oui0TaLJg; Follow on Google+: https://plus.google.com/+ Sephora/posts; Follow SEPHORA on Wanelo: http://wanelo.com/sephora and Follow SEPHORA on Tumblr: http://theglossy.sephora.com/. I am a 48 year old Esthetician and beauty blogger with 26 years of experience in the industry. I love to be able to treat acenic skin the most.